Discerning the Mystery: History.com Hints at Operation High Jump - Could We Be Witnessing a Buildup to a Full Disclosure Event? History.com Hints at Operation High Jump - Could We Be Witnessing a Buildup to a Full Disclosure Event? Do you believe in coincidences? What about the coincident MSM disclosures of multiple formerly secretive subjects disclosed only months after their revelation by veteran whistleblowers? If after seeing the recent and other-worldly disclosures of exoplanets, of possible life on Mars, and hints at the existence of intelligent ETs in mainstream news, we may each want to take a second look at such "coincidences." It has become difficult to count all of the mainstream disclosures coming forward which suggest that the world we believe to be true and forthright only represents a small portion of reality. With this in mind, we might ask, "If the secrecy which maintained the blanket ignorance of the general public were to suddenly disappear, what might the result be?" Further, if such disclosures were executed gradually, would we notice them? Perhaps one of the most bizarre, yet very likely historical occurrences was that of Operation High Jump. Executed during the 1950s (near the end of WWII), this operation by U.S. forces was aimed at confronting the ongoing Nazi activities in Antarctica at the time, according to testimony. The true nature of these journeys of the U.S. Navy to the Antarctic represent some of the most highly disputed and yet most interesting possibilities within conversations in alternative history. Some believed these efforts to have been military-oriented while others insist the expedition was merely scientific in nature, as it was claimed to be in mainstream history. We will discuss the deeper details after a word from History.com regarding alleged Nazi activity in Antarctica. Adolf Hitler used the concept of Lebensraum (“living space”) to justify the invasion of Poland, Russia and other eastern European nations to his people. 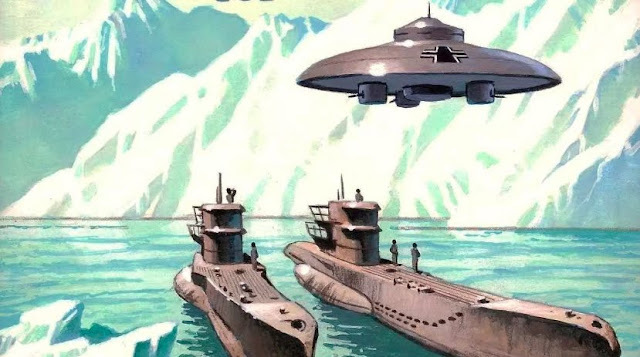 But one small chapter in Hitler’s drive for new land is often overlooked: how the Third Reich’s hunger for margarine led to a secret expedition to Antarctica 80 years ago. The tale begins in the summer of 1936. Hitler had completed a four-year plan to boost the German military and the domestic economy to be ready for war by 1940. He put Hermann Göring in charge, and then he developed a “German Fat Plan” to enable Germany to improve the efficiency of its domestic consumption of butter, milk, cream, lard, cheese, bacon, margarine, salad oils, detergents, candles, linoleum and paints. The idea was to find substitutes for these oil- and fat-based products in case imported sources were cut off. At the time, whale oil was one of the main ingredients for margarine, and Germans ate a lot of margarine. The Schwabenland, the ship of the 1938 German Antarctic expedition. So Germany began building factory whaling ships to ply the Southern Ocean. At the time, commercial whaling had been decimated in the North Atlantic and North Pacific. German whaling ships were operating far from home, so the idea of establishing an Antarctic base seemed like a good idea. In August 1936, the German Foreign Office found some unclaimed territory in Antarctica between Norwegian and British zones and an expedition to explore and claim the region between 20 degrees east and 10 degrees west—part of an area known as Queen Maud Land—took shape. The expedition was organized in the summer of 1938, led by Capt. Alfred Ritscher, a decorated World War I naval commander who had married a prominent Jewish artist. He selected his crew for the secretive mission based on polar experience rather than membership in the Nazi party. 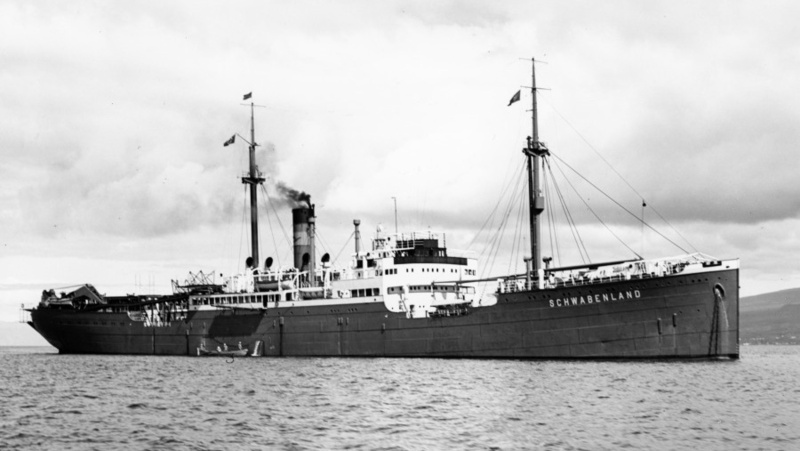 After three months of repairs to turn the Schwabenland into an icebreaker, the captain sailed from Hamburg on December 17, 1938, with a crew of 82 scientists, officers and enlisted men, as well as two Dornier flying boats perched on catapults. A map of Antarctica highlighting the Nazi-claimed area, New Swabia. The ship reached the Antarctic coastline a month later, and began aerial reconnaissance using the flying boats. The mountainous region had never been explored and the German scientists named it “Neu-Schwabenland” after the ship. These flights had two purposes, to photograph the area for scientific research and cartography, and also to claim it for Nazi Germany. But things didn’t always work out as planned. On one air flight, the crew was running low on fuel and was forced to throw out extra gear to lighten the aircraft weight. That included boxes of the tiny metal swastikas, which were supposed to be dropped across that part of Antarctica to cement the Nazi territorial claim. Those little swastikas were never recovered. Still, these photographic surveys covered a huge part of Antarctica and increased the size of the known area by 16 percent, according to Lüdecke’s historical research. The surveys covered more territory than the German homeland at the time. The Schwabenland expedition didn’t last long, they completed their work and began the long trip home on February 5, 1939. One the way home, the ship conducted scans of the seafloor along the Atlantic Ocean. The ship’s scientists detected seismic activity that they believed was a line of volcanoes running north to south along the middle of the Atlantic. Decades later, this line of volcanoes was found to be the Mid-Atlantic Ridge, a region where two of the Earth’s tectonic plates are pulling apart and forming new sections of the seafloor. Much of the expedition’s science was either lost during the war, or kept under wraps until it was finally published in 1958. If we are familiar with whistleblower testimonies regarding WWII, we may find this account of German polar expeditions particularly convenient. The timing of the mission, the destination of the mission, and the proposed intentions surrounding the ordeal might serve quite well as a cover story for a secretive war effort by Nazi forces. It seems very unlikely that the Nazis (or any force, for that matter) would launch an expedition to one of the most treacherous territories on the planet during war-time without having some military intention in mind. Those who have studied the history of Operation Paperclip may also be familiar with the parallel effort by the U.S. Navy of Operation High Jump. High Jump was an effort intended by U.S. naval command to investigate and confront the German military operations which were found to be taking place in the Antarctic during and following WWII (to restate). These efforts were quite large in scale and required a significant amount of time and energy to plan and execute, and this leads us to believe there is much more to this expedition than the mainstream is willing to address. Below is an excerpt from an article by Exopolitics.org which contains several key details of the classified side of Operation High Jump. An extraordinary 2006 Russian documentary was recently translated into English revealing new information about a US Navy Antarctica expedition in 1946/47. Originally scheduled for a six month period, the “scientific” expedition was officially called “The United States Navy Antarctic Development Program,” and given the operational name Highjump. The naval component of Operation Highjump was known as Task Force 68 and comprised 4700 military personnel, one aircraft carrier (the USS Philippine Sea among the largest of all carriers of the time), and [a] number of naval support ships and aircraft. Admiral Byrd’s statements were published in the Chilean Press but never publicly confirmed by US authorities. Indeed Byrd did not speak again to the Press about Operation Highjump, leaving it for researchers to speculate for decades over what really happened, and why Byrd was silenced. After the Soviet collapse in 1991, the KGB released previously classified files that cast light on the mysterious Byrd led Naval expedition to Antarctica. A 2006 Russian documentary, recently translated, made public for the first time a 1947 secret Soviet intelligence report commissioned by Joseph Stalin of Task 68’s mission to Antarctica. The intelligence report, gathered from Soviet spies embedded in the US, revealed that the US Navy had sent the military expedition to find and destroy a hidden Nazi base. On the way, they encountered a mysterious UFO force that attacked the military expedition destroying several ships and a significant number of planes. Indeed, Operation Highjump had suffered “many casualties” as stated in initial press reports from Chile. While there is a possibility the report resulted from US disinformation fed to a known Soviet mole, the more likely explanation is that the report exposes the first known historical incident involving a battle between US naval forces and an unknown UFO force stationed near Antarctica. 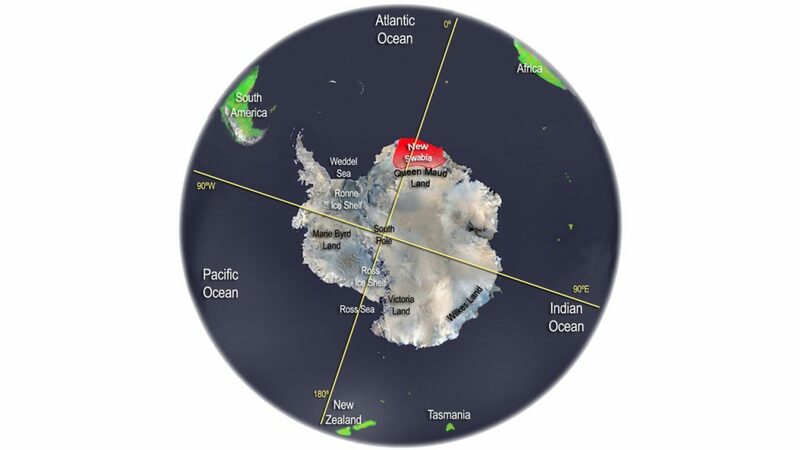 Considering the extremely classified nature of the mission to Antarctica, it is understandable that the public is still largely uncertain of the details of this mission. The late William Tompkins was one of the first modern whistleblowers to reveal High Jump in as much detail as he did. According to his testimony, the mission to the Antarctic came as a result of a classified spying operation that was taking place behind the lines of German forces. Tompkins worked for Douglas Aircraft company in the U.S. Navy and eventually found himself in a top secret think tank where roughly 200 other specialists worked on classified projects. These personnel investigated every aspect of possible applications of UFO technology to military and commercial aircraft, and according to Tompkins, it was this think tank that directly worked with the American spies who had gathered intel from behind Nazi lines. According to Tompkins testimony, the American spies were sent to Germany and came back with intel that shocked and baffled even high-ranking military personnel. The Nazis were found to be building a series of massive underground production facilities, according to testimony. Within these facilities, they were building advanced UFO and high-tech weaponry as well as more conventional weapons of war. These Nazis were actually back-engineering UFO technology and adapting it to assist the German military war machine, according to Tompkins. Toward the end of the war, the Germans were anticipating their defeat. 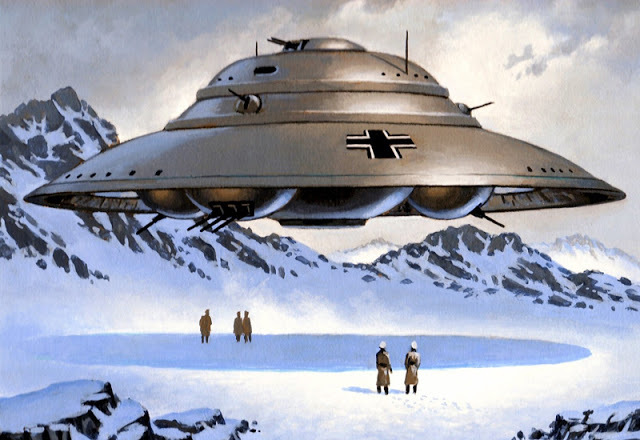 So they decided to let their German war machine fall and relocated to Antarctica in order to continue their efforts there. The relocation operation was massive in scale, but eventually, the Nazis completed their move. Their new goal was to build out their advanced technology and conquer space instead of the planet. This was the testimony which William Tompkins contributed to the ongoing disclosure efforts. They offer exceptionally interesting details of classified information to consider. The testimony also reveals the strong possibility that the above article from History.com is not merely a reveal of a Nazi party looking for condiments at the South Pole. Just as in every case of the soft disclosure narrative, the corporate media appears to be hinting at this subject of classified military operations occurring in Antarctica—a very well-known topic within alternative circles. This method of disclosure appears to involve the MSM revealing numerous subtle hints toward the subjects we have already heard from several whistleblowers. Many of these stories corroborate each other quite well, and are considered to have a high probability of being true. Yet the MSM continues to merely flirt with the full revelation. They cover the subjects of ET life, the possible construction of moon bases, as well as the likelihood that life on Earth had some level of ET contact in ancient history. These partial revelations also suggest a history of the solar system far different than conventional science has maintained for decades. Every time the media discusses these topics, they take baby steps toward a full disclosure, but never quite get there. According to testimony, the MSM is deliberately revealing the truth gradually over a longer period of time. In part, this may be for honest purposes, but on the other hand, the slow revelation is being used as a distraction from all of the key revelations of pedophilia and past/present government corruption coming forward right now. This has been the plan of certain covert interests for some time, according to whistleblowers. While some desire only to use a partial disclosure for their own personal gain, others desire for a full disclosure event to be executed more quickly than the gradual rationing of half-truths we are currently witnessing. Many citizens believe that it is time for this information to come forward. They believe that the truth has waited long enough to see the light of day, and that the world does not need to wait a century to be told that ETs exist. It may be time to pick up the pace for the sake of the truth, and no need to take so long to reveal information which so many others are already privy to. In fact, it may very well be that this complete and thorough revelation is already underway. Even still, this does not eliminate the need for we the people to ensure its occurrence.